Liverpool co-owner Tom Hicks is unwilling to sell his share in the club to Dubai International Capital and aims to buy out partner George Gillett. DIC has tabled a formal £400m bid to take control from the American duo. BBC sports editor Mihir Bose told BBC 5 Live: "Hicks has been willing to have DIC as a minority stakeholder. He's not willing to sell a controlling interest. "Tom Hicks is working on a plan where he would buy out his partner George Gillett, who is minded to sell to DIC." Hicks has not formally rejected the offer from DIC, the Government-run Dubai investment fund, but is still unwilling to sell out. DIC has insisted there is no deadline on its bid to buy out the Americans, who took control of the club in a deal worth £218.9m in February 2007. Bose explained: "Gillett and Hicks have an informal understanding that one won't sell without the other and DIC has never been interested in being a minority stakeholder, and would not be interested in getting into bed with Hicks with a 50-50 partnership." He added: "There is a bit more to go but some conclusion will be reached - either Hicks will raise the money to buy out Gillett and take total control, or there will be a sale of the club. I suspect it will be another couple of months at least before it is resolved." DIC confirmed on Tuesday it had been in talks with American duo Hicks and Gillett about purchasing a stake in the Anfield club. "It's no secret that we have been in discussions with the current owners," said DIC chief executive Sameer al-Ansari. "It's not easy because (they) are in dreamland about valuations." Al-Ansari later clarified that one of the club's owners "had come out of dreamland", without giving further details. Bose said: "The fact that DIC has gone so public on this means they know that the offer is not being accepted and they are trying to use fan pressure, like the Americans did last year." Texan billionaire Hicks said in February he was not planning to sell a stake in Liverpool, denying media speculation he was in talks with DIC over a sale. He also revealed that Gillett could not sell his stake in the Premier League club without his approval. However, both Hicks and Gillett have become increasingly unpopular among Reds fans, drawing criticism for their treatment of manager Rafael Benitez and their financial management of the club. 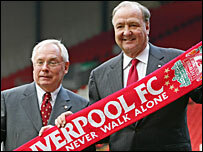 That has given fresh hope to DIC, which was considering buying Liverpool before the Americans joined forces to complete their own takeover in February 2007. Hicks said in January he had talked to DIC "once" about a 10-15% stake, but DIC said the valuation was too high. DIC is thought to want a controlling stake at Anfield, meaning it would need to convince Hicks to relinquish part of his 50% of the club as well as buying out Gillett. Another obstacle is the refinancing package announced on 25 January that has loaded £105m of debt on to the club. Of that, £60m is earmarked to kick-start the new stadium development at Stanley Park plus £45m for future player transfers and to meet the club's working capital needs. DIC, which manages about £6.5bn of assets, is owned by Sheikh Mohammed bin Rashid al-Maktoum, the ruler of Dubai. Al-Ansari was the man behind the takeover bid a year ago and looked to have succeeded until then Liverpool owner David Moores suddenly opted to sell to the Americans. "It took me two weeks to get over that," said al-Ansari, who is a Liverpool fan. "But it didn't dent my passion - I still go to every match when I'm here."